When one is talented and lucky enough to be deemed worthy of a certificate or award for superior accomplishment, a notable talent, good-deed-doing or receives a wonderful writeup in a magazine or newspaper, many people run over to the store, get a little black and gold ready-made frame and that's that. Or, heaven forbid, they take the certificate to a trophy shop and have it perma-plaqued onto a board! This is similar to pouring molten plastic over a tree stump to make a coffee table and your certificate can never be removed or reframed. The problem with purchasing a standard sized ready-made frame is that then a piece of cardboard full of acid acts as backing and the certificate is touching the glass on the front; both situations being huge conservation no no's. If you would like your accomplishments to outlive you, frame with preservation in mind. 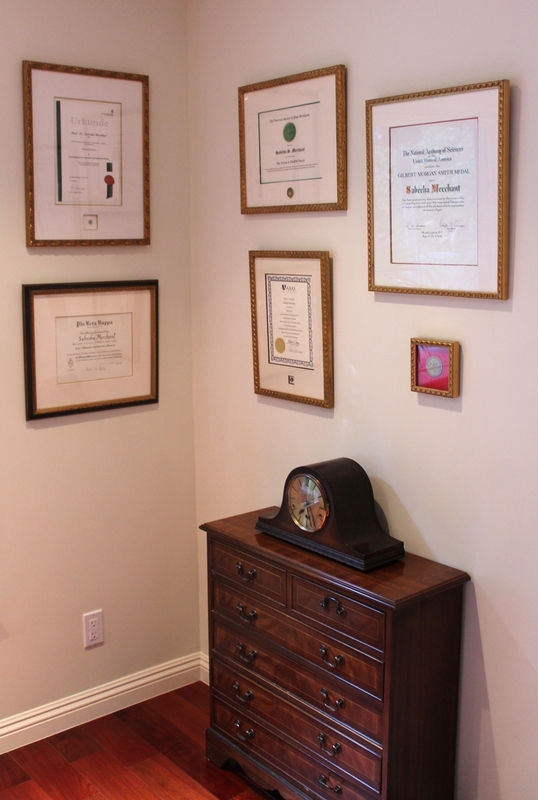 One of the most challenging and exciting commemorative projects we've done was the framing of a client's Nobel Prize. We designed and hand constructed a three-dimentional box to accommodate the leather bound certificate as well as the medals. No adhesives of any kind were used to secure these elements and the box was upholstered in silk with gold fillet trim at the openings. Our craftsmen hand carved and gilded the frame with scraffito detailing at the corners and UV protective acrylic completes the archival package. The moral to this story is that certificates, diplomas, awards and articles need to be properly protected but do not need to be boring! Why shouldn't a wall of kudos be as dynamic as a wall of wonderful art?